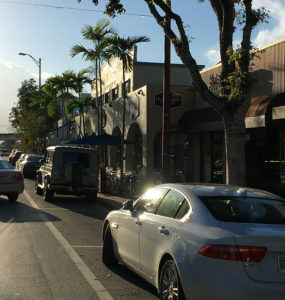 South Miami Town Center’s streetscape sports a mix of architectural styles, among them, historically designated buildings dating from 1914 to 1955. They serve to bookend two major periods of construction activity; from the Jazz Age in the 1920s to the post World War II boom in the 1950s. 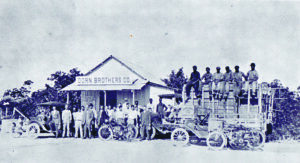 South Miami began much as other south Florida towns with the arrival of pioneer families in the late 19th century. 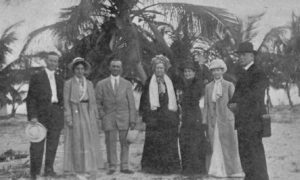 The early development of what was to become the City of South Miami is inextricably linked to the establishment of Henry Morrison Flagler’s Florida East Coast Railway (FEC) in Miami and the rail’s southward expansion to Homestead and Key West. Arriving in Miami in 1896, the railway became essential to the prosperity of those pioneers who came to the region to establish homesteads, farm the land, and cut the timber. The railway provided those living in what was essentially an outpost serviced by unpaved trails, a sophisticated link to ever-expanding markets for their products. 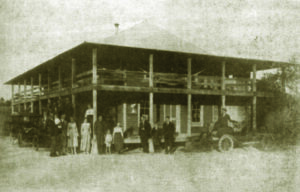 Eventually, Mr. Larkins owned scores of acres of farmland, operated a small dairy, the post office, a general store and with the coming of the rail line to what is now Sunset Drive and Dixie Highway, a commissary, packing house, and siding with station where the tracks crossed Larkins Road (Sunset Drive). Along with other growers and lumbermen, Larkins purchased land closer to the FEC railway as the center of the small settlement shifted westerly. 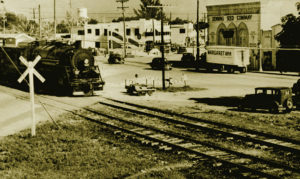 The railroad and those who came to south Florida as tourists, laborers, and service men), helped to fund the businessmen and homesteaders who created what officially became the City of South Miami in 1927. Brothers Harold and Robert Dorn from Chicago settled in the Miami area about 1910. “We came with farming in mind,” wrote Harold Dorn. And that they did–principally tomatoes, grapefruit, mangoes and avocados. They purchased land for warehouses near the FEC railway in Larkins. 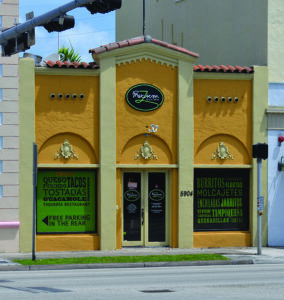 Ever the entrepreneurs, the Dorn brothers bought commercial real estate that would provide services to the future City of South Miami. 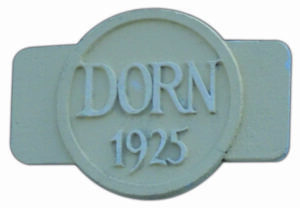 Today known as the Amster Properties on the corner of Sunset Drive and Dixie Highway, the three Dorn buildings have survived and retain most of their original architectural features. 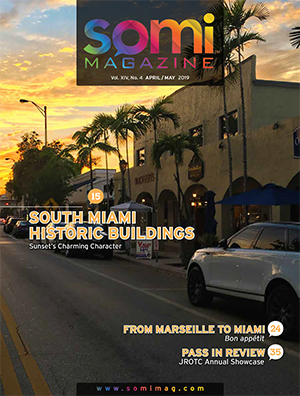 All are designated as historic structures: the Dorn-Martin drugstore (1925), the Bank building (1926) and the South Miami Post Office (1926). 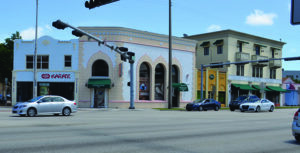 The three buildings form a unit and wrap around the corner and are part of the historic gateway that introduces the eastern entrance to South Miami’s Town Center from Dixie Highway. Each building speaks to the era in which it was built; but each speaks in a different dialect. 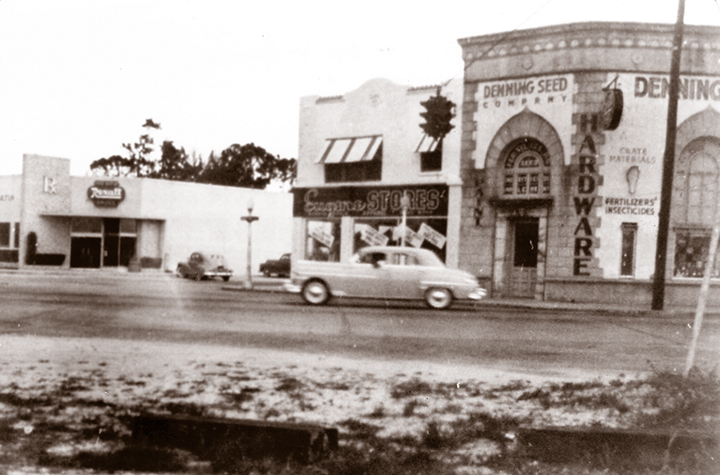 The Dorn-Martin drugstore fronts directly onto Sunset Drive and anchors the corner of Dorn Avenue. It is considered to be in the Mission Style adapted for a commercial building. 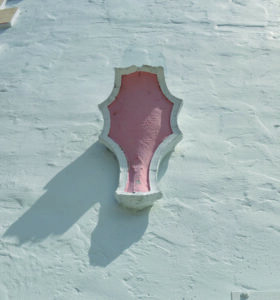 Noteworthy attributes of the stucco building include the curved parapet, the engaged pilasters, the band course separating first and second stories, and the decorative glazed ceramic tile accents. 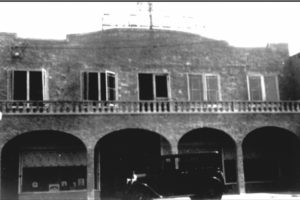 Through time and prior to historic designation, the arched corner entrance to the building was significantly altered to the somewhat plain arrangement it has today. 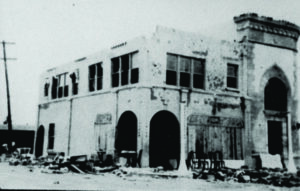 The second structure, constructed for use as a branch of the South Florida Bank (that never was), is a two-story building that wraps around the corner. Elements derived from Neoclassical architecture distinguish the façade with triple arched openings, alternating large and small blocks of stone at the corners, all of which is capped by a weighty cornice. Originally, mullions decorated the windows in fixed glass panels, later replaced with modern float glass. The third, a one-story building, uses forms often found in Mediterranean Revival style façades. It is divided into three bays topped by blind, round arches; the flat roof is relieved by a small pediment located over the central bay. a number of changes through time. Originally a one-story retail building, Mr. Shelley later added and extended the arcade (loggia) and built a second floor with apartments. Topping the loggia was a decorative balustrade (later removed) that provided a pleasing visual break between the two floors. The second floor elevation sported casement windows that worked with the balustrade to balance the robust arches on the first floor. The building was designated historic by the City on April 18, 2006 both for its historic connections and for the retention of sufficient amounts of its original architectural character. 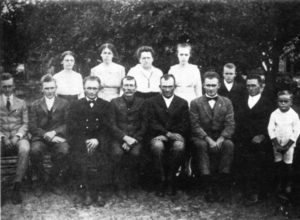 The George H. Shelley family came to the Town of Larkins in 1911 from Hornell, New York. His son, Robert along with other Larkins citizens, was one of the founders of the City of South Miami. In that same year, Robert was operating a grocery and dry goods store in the family property at 5837 Sunset Drive. Subsequently, he became a millionaire through his patented invention of a spring that would be used in self-leveling machines, particularly for use in cafeterias. The Crossroads Building at 5700 Sunset Drive, built in 1955, represents the most modern architecture in the City’s inventory of historic buildings in the Town Center. 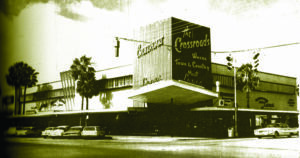 It was no accident that the Crossroads Building was sited at one of the city’s major intersections. Firmly planted in the streetscape, this landmark wraps around and dominates the corner at Sunset Drive and Red Road, announcing its importance as a post-World War II shopping center from the western entrance to city’s downtown. Billed as the place “Where town and country meet,” the building reflects a time of prosperity when the nation was re-building and the suburbs were all the rage. Architect M. Tony Sherman (1910-1999) was hired to design the building. 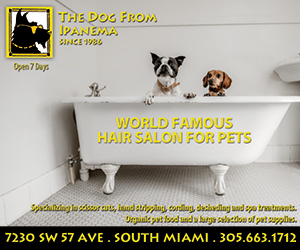 Sherman had the successful architectural firm of M. Tony Sherman and Associates in Miami. 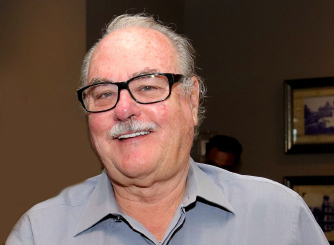 He is noteworthy as the designer of several Mid-Century Modern hostelries, including the Jolly Roger and Yankee Clipper in Fort Lauderdale, the original Castaways in North Miami Beach, and the original Tropicana Hotel and Casino in Las Vegas. Stylistically, a number of his commissions were playful, reflecting the kind of Florida resort image that pervaded the popular culture of the 1950s. It was a blend of themes that included pirates, ships and Polynesian-inspired lounges decked-out with tiki statues, torches, and other kitsch. Sherman originally practiced in New York where, according to the Miami News of 1960, he worked with the New York Housing Authority and did special exhibits for the World’s Fair. 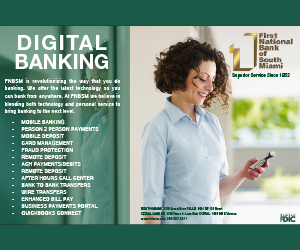 He came to Miami in 1947 and opened a new office in the Sans Souci Estates in North Miami in 1960. Sherman seems to have supported his firm with commissions that included freezer plants, cold storage plants, and office buildings as well as his more imaginative motels and hotels. Conceptualized during a time of exuberance for the “atomic age” and modernity, the Crossroads Building reflects the nation’s belief in a brighter future. In post-war America, cities remained healthy. Suburbs were expanding with the aid of the GI Bill, increased automobile ownership, and improved roadways. 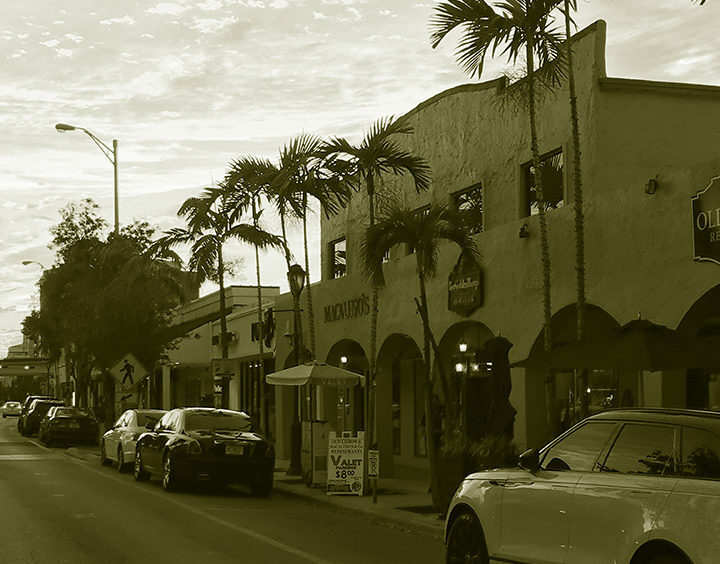 The City of South Miami experienced the same era of prosperity and began to promote itself accordingly. Expanded opportunities for consumers in downtown South Miami were envisioned by Wiltex Properties who hired Sherman to design a “state-of-the-art” shopping complex. 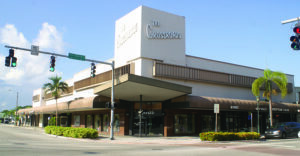 The building would offer a series of shops on its two primary locations at Red Road and Sunset Drive. The building’s first floor was designed to accommodate 12 shops; the largest at the northeast corner. Shops had a mezzanine level at the back in which to display merchandise. The second floor was divided into office spaces. There was one elevator and air-conditioning (considered a modern luxury at the time). Tony Sherman designed a building with a cantilevered canopy atop which was constructed a large tower-like affair that served to display the name of the shopping center in large letters, “Crossroads: Where Town and Country Meet.” The parapet-like arrangement of the tower was originally made of vertical redwood planks that corresponded to the redwood louvers set into the projecting window frames running horizontally around the top of the building. Planking purportedly decorated the canopy but, like the tower, this planking was eventually removed. A set of fins running vertically on the eastern elevation added another “modern” element that helped to balance some of the mass of the tower/canopy entrance. Over time, they were removed. The effect of Sherman’s design was to transform the tower into a giant signboard, one which was readily visible from a moving vehicle, heralding the shopping center located at the heart of downtown. 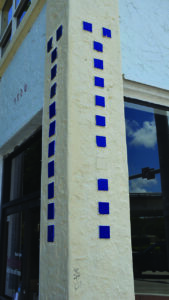 Like most communities, the City of South Miami’s historic architecture informs us about the past. The City’s downtown boasts a number of buildings that have been designated as architecturally and historically significant; they represent periods of growth, a belief in the future, and the power of design.